"Upwardly mobile" redirects here. For the Irish television series, see Upwardly Mobile. Social mobility is the movement of individuals, families, households, or other categories of people within or between social strata in a society. It is a change in social status relative to one's current social location within a given society. Social mobility is defined as the movement of individuals, families, households, or other categories of people within or between layers or tiers in an open system of social stratification. Open stratification systems are those in which at least some value is given to achieved status characteristics in a society. The movement can be in a downward or upward direction. " Social mobility is any change in social position." Mobility is most often quantitatively measured in terms of change in economic mobility such as changes in income or wealth. Occupation is another measure used in researching mobility, which usually involves both quantitative and qualitative analysis of data, but other studies may concentrate on social class. Mobility may be intragenerational, within the same generation, or intergenerational, between different generations. Intragenerational mobility is less frequent, representing "rags to riches" cases in terms of upward mobility. Intergenerational upward mobility is more common, where children or grandchildren are in economic circumstances better than those of their parents or grandparents. In the US, this type of mobility is described as one of the fundamental features of the "American Dream" even though there is less such mobility than almost all other OECD countries. Illustration from a 1916 advertisement for a vocational school in the back of a US magazine. 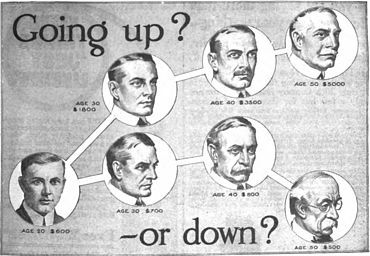 Education has been seen as a key to social mobility, and the advertisement appealed to Americans' belief in the possibility of self-betterment as well as threatening the consequences of downward mobility in the great income inequality existing during the Industrial Revolution. Education provides one of the most promising chances of upward social mobility into a better social class and attaining a higher social status, regardless of current social standing in the overall structure of society. However, the stratification of social classes and high wealth inequality directly affects the educational opportunities people are able to obtain and succeed in, and the chance for one's upward social mobility. In other words, social class and a family's socioeconomic status directly affect a child's chances for obtaining a quality education and succeeding in life. By age five, there are significant developmental differences between low, middle, and upper class children's cognitive and noncognitive skills. Among older children, evidence suggests that the gap between high- and low-income primary- and secondary-school students has increased by almost 40 percent over the past thirty years. These differences persist and widen into young adulthood and beyond. Just as the gap in K–12 test scores between high- and low-income students is growing, the difference in college graduation rates between the rich and the poor is also growing. Although the college graduation rate among the poorest households increased by about 4 percentage points between those born in the early 1960s and those born in the early 1980s, over this same period, the graduation rate increased by almost 20 percentage points for the wealthiest households. Average family income, and social status, have both seen a decrease for the bottom third of all children between 1975-2011. The 5th percentile of children and their families have seen up to a 60% decrease in average family income. The wealth gap between the rich and the poor, the upper and lower class, continues to increase as more middle-class people get poorer and the lower-class get even poorer. As the socioeconomic inequality continues to increase in the United States, being on either end of the spectrum makes a child more likely to remain there, and never become socially mobile. A child born to parents with income in the lowest quintile is more than ten times more likely to end up in the lowest quintile than the highest as an adult (43 percent versus 4 percent). And, a child born to parents in the highest quintile is five times more likely to end up in the highest quintile than the lowest (40 percent versus 8 percent). This is due to lower- and working-class parents (where neither is educated above high school diploma level) spending less time on average with their children in their earliest years of life and not being as involved in their children's education and time out of school. This parenting style, known as "accomplishment of natural growth" differs from the style of middle-class and upper-class parents (with at least one parent having higher education), known as "cultural cultivation". More affluent social classes are able to spend more time with their children at early ages, and children receive more exposure to interactions and activities that lead to cognitive and non-cognitive development: things like verbal communication, parent-child engagement, and being read to daily. These children's parents are much more involved in their academics and their free time; placing them in extracurricular activities which develop not only additional non-cognitive skills but also academic values, habits, and abilities to better communicate and interact with authority figures. Lower class children often attend lower quality schools, receive less attention from teachers, and ask for help much less than their higher class peers. The chances for social mobility are primarily determined by the family a child is born into. Today, the gaps seen in both access to education and educational success (graduating from a higher institution) is even larger. Today, while college applicants from every socioeconomic class are equally qualified, 75% of all entering freshmen classes at top-tier American institutions belong to the uppermost socioeconomic quartile. A family's class determines the amount of investment and involvement parents have in their children's educational abilities and success from their earliest years of life, leaving low-income students with less chance for academic success and social mobility due to the effects that the (common) parenting style of the lower and working-class have on their outlook on and success in education. These differing dimensions of social mobility can be classified in terms of differing types of capital that contribute to changes in mobility. Cultural capital, a term first coined by French sociologist Pierre Bourdieu distinguishes between the economic and cultural aspects of class. Bourdieu described three types of capital that place a person in a certain social category: economic capital; social capital; and cultural capital. Economic capital includes economic resources such as cash, credit, and other material assets. The cultural resources a person has obtained can heavily influence a child's educational success. It has been shown that students raised under the concerted cultivation approach have "an emerging sense of entitlement" which leads to asking teachers more questions and being a more active student, causing teachers to favor students raised in this manner. This childrearing approach which creates positive interactions in the classroom environment is in contrast with the natural growth approach to childrearing. In this approach, which is more common amongst working-class families, parents do not focus on developing the special talents of their individual children, and they speak to their children in directives. Due to this, it is more rare for a child raised in this manner to question or challenge adults and conflict arises between childrearing practices at home and school. Children raised in this manner are less inclined to participate in the classroom setting and are less likely to go out of their way to positively interact with teachers and form relationships. In the United States, links between minority underperformance in schools have been made with a lacking in the cultural resources of cultural capital, social capital, and economic capital, yet inconsistencies persist even when these variables are accounted for. "Once admitted to institutions of higher education, African Americans and Latinos continued to underperform relative to their white and Asian counterparts, earning lower grades, progressing at a slower rate, and dropping out at higher rates. More disturbing was the fact that these differentials persisted even after controlling for obvious factors such as SAT scores and family socioeconomic status". The theory of capital deficiency is among the most recognized explanations for minority underperformance academically—that for whatever reason they simply lack the resources to find academic success. One of the largest factors for this, asides from the social, economic, and cultural capital mentioned earlier, is human capital. This form of capital, identified by social scientists only in recent years, has to do with the education and life preparation of children. "Human capital refers to the skills, abilities, and knowledge possessed by specific individuals". This allows college-educated parents who have large amounts of human capital to invest in their children in certain ways to maximize future success—from reading to them at night to possessing a better understanding of the school system which causes them to be less differential to teachers and school authorities. Research also shows that well-educated black parents are less able to transmit human capital to their children when compared to their white counterparts, due to a legacy of racism and discrimination. The Great Gatsby Curve. Countries with more equality of wealth also have more social mobility. This indicates that equality of wealth and equality of opportunity go hand-in-hand. In a study for which the results were first published in 2009, Wilkinson and Pickett conduct an exhaustive analysis of social mobility in developed countries. In addition to other correlations with negative social outcomes for societies having high inequality, they found a relationship between high social inequality and low social mobility. Of the eight countries studied—Canada, Denmark, Finland, Sweden, Norway, Germany, the UK and the US, the US had both the highest economic inequality and lowest economic mobility. In this and other studies, in fact, the USA has very low mobility at the lowest rungs of the socioeconomic ladder, with mobility increasing slightly as one goes up the ladder. At the top rung of the ladder, however, mobility again decreases. In Britain, much debate on social mobility has been generated by comparisons of the 1958 National Child Development Study (NCDS) and the 1970 Birth Cohort Study BCS70, which compare intergenerational mobility in earnings between the 1958 and the 1970 UK cohorts, and claim that intergenerational mobility decreased substantially in this 12-year period. These findings have been controversial, partly due to conflicting findings on social class mobility using the same datasets, and partly due to questions regarding the analytical sample and the treatment of missing data. UK Prime Minister Gordon Brown has famously said that trends in social mobility "are not as we would have liked". Along with the aforementioned "Do Poor Children Become Poor Adults?" study, The Economist also stated that "evidence from social scientists suggests that American society is much 'stickier' than most Americans assume. Some researchers claim that social mobility is actually declining." A German study corroborates these results. In spite of this low mobility Americans have had the highest belief in meritocracy among middle- and high-income countries. A study of social mobility among the French corporate class has found that class continues to influence who reaches the top in France, with those from the upper-middle classes tending to dominate, despite a longstanding emphasis on meritocracy. Thomas Piketty (2014) finds that wealth-income ratios, today, seem to be returning to very high levels in low economic growth countries, similar to what he calls the "classic patrimonial" wealth-based societies of the 19th century wherein a minority lives off its wealth while the rest of the population works for subsistence living. Social mobility can also be influenced by differences that exist within education. The contribution of education to social mobility often gets neglected in social mobility research although it really has the potential to transform the relationship between origins and destinations. Recognizing the disparities between strictly location and its educational opportunities highlights how patterns of educational mobility are influencing the capacity for individuals to experience social mobility. There is some debate regarding how important educational attainment is for social mobility. A substantial literature argues that there is a direct effect of social origins (DESO) which cannot be explained by educational attainment. However, other evidence suggests that, using a sufficiently fine-grained measure of educational attainment, taking on board such factors as university status and field of study, education fully mediates the link between social origins and access to top class jobs. The patterns of educational mobility that exist between inner city schools versus schools in the suburbs is transparent. Graduation rates supply a rich context to these patterns. In the 2013–14 school year, Detroit Public Schools observed a graduation rate of 71% whereas Grosse Pointe High School (Detroit suburb) observed an average graduation rate of 94%. A similar phenomena was observed in Los Angeles, California as well as in New York City. Los Angeles Senior High School (inner city) observed a graduation rate of 58% and San Marino High School (suburb) observed a graduation rate of 96%. New York City Geographic District Number Two (inner city) observed a graduation rate of 69% and Westchester School District (suburb) observed a graduation rate of 85%. These patterns were observed across the country when assessing the differences between inner city graduation rates and suburban graduation rates. Participants at midlife did not necessarily end up in the same social class as their fathers. There was social mobility in the sample: 45% of men were upwardly mobile, 14% were downward mobile and 41% were socially stable. IQ at age 11 had a graded relationship with participant's social class. The same effect was seen for father's occupation. Men at midlife social class I and II (the highest, more professional) also had the highest IQ at age 11. Height at midlife, years of education and childhood IQ were significantly positively related to upward social mobility, while number of siblings had no significant effect. For each standard deviation increase in IQ score at the age 11, the chances of upward social mobility increases by 69% (with a 95% confidence). After controlling the effect of independent variables, only IQ at age 11 was significantly inversely related to downward movement in social mobility. More years of education increase the chance that a father's son will surpass his social class, whereas low IQ makes a father's son prone to falling behind his father's social class. Higher IQ at age 11 was also significantly related to higher social class at midlife, higher likelihood car driving at midlife, higher first social class, higher father's social class, fewer siblings, higher age of education, being taller and living in a less deprived neighbourhood at midlife. IQ was significantly more strongly related to the social class in midlife than the social class of the first job. Another research looked into the pivotal role of education in association between ability and social class attainment through three generations (fathers, participants and offspring) using the SMS1932 (Lothian Birth Cohort 1921) educational data, childhood ability and late life intellectual function data. It was proposed that social class of origin acts as a ballast restraining otherwise meritocratic social class movement, and that education is the primary means through which social class movement is both restrained and facilitated—therefore acting in a pivotal role. It was found that social class of origin predicts educational attainment in both the participant's and offspring generations. Father's social class and participant's social class held the same importance in predicting offspring educational attainment—effect across two generations. Educational attainment mediated the association of social class attainments across generations (father's and participants social class, participant's and offspring's social class). There was no direct link social classes across generations, but in each generation educational attainment was a predictor of social class, which is consistent with other studies. Also, participant's childhood ability moderately predicted their educational and social class attainment (.31 and .38). Participant's educational attainment was strongly linked with the odds of moving downward or upward on the social class ladder. For each SD increase in education, the odds of moving upward on the social class spectrum were 2.58 times greater (the downward ones were .26 times greater). Offspring's educational attainment was also strongly linked with the odds of moving upward or downward on the social class ladder. For each SD increase in education, the odds of moving upward were 3.54 times greater (the downward ones were .40 times greater). In conclusion, education is very important, because it is the fundamental mechanism functioning both to hold individuals in their social class of origin and to make it possible for their movement upward or downward on the social class ladder. There were some great contributors to social class attainment and social class mobility in the twentieth century: Both social class attainment and social mobility are influenced by pre-existing levels of mental ability, which was in consistence with other studies. So, the role of individual level mental ability in pursuit of educational attainment—professional positions require specific educational credentials. Furthermore, educational attainment contributes to social class attainment through the contribution of mental ability to educational attainment. Even further, mental ability can contribute to social class attainment independent of actual educational attainment, as in when the educational attainment is prevented, individuals with higher mental ability manage to make use of the mental ability to work their way up on the social ladder. This study made clear that intergenerational transmission of educational attainment is one of the key ways in which social class was maintained within family, and there was also evidence that education attainment was increasing over time. Finally, the results suggest that social mobility (moving upward and downward) has increased in recent years in Britain. Which according to one researcher is important because an overall mobility of about 22% is needed to keep the distribution of intelligence relatively constant from one generation to the other within each occupational category. Researchers looked into the effects elitist and non-elitist education systems have on social mobility. Education policies are often critiqued based on their impact on a single generation, but it is important to look at education policies and the effects they have on social mobility. In the research, elitist schools are defined as schools that focus on providing its best students with the tools to succeed, whereas an egalitarian school is one that predicates itself on giving equal opportunity to all its students to achieve academic success. When private education supplements were not considered, it was found that the greatest amount of social mobility was derived from a system with the least elitist public education system. It was also discovered that the system with the most elitist policies produced the greatest amount of utilitarian welfare. Logically, social mobility decreases with more elitist education systems and utilitarian welfare decreases with less elitist public education policies. When private education supplements are introduced, it becomes clear that some elitist policies promote some social mobility and that an egalitarian system is the most successful at creating the maximum amount of welfare. These discoveries were justified from the reasoning that elitist education systems discourage skilled workers from supplementing their children's educations with private expenditures. The authors of the report showed that they can challenge conventional beliefs that elitist and regressive educational policy is the ideal system. This is explained as the researchers found that education has multiple benefits. It brings more productivity and has a value, which was a new thought for education. This shows that the arguments for the regressive model should not be without qualifications. Furthermore, in the elitist system, the effect of earnings distribution on growth is negatively impacted due to the polarizing social class structure with individuals at the top with all the capital and individuals at the bottom with nothing. Education is very important in determining the outcome of one's future. It is almost impossible to achieve upward mobility without education. Education is frequently seen as a strong driver of social mobility. The quality of one's education varies depending on the social class that they are in. The higher the family income the better opportunities one is given to get a good education. The inequality in education makes it harder for low-income families to achieve social mobility. Research has indicated that inequality is connected to the deficiency of social mobility. In a period of growing inequality and low social mobility, fixing the quality of and access to education has the possibility to increase equality of opportunity for all Americans. "One significant consequence of growing income inequality is that, by historical standards, high-income households are spending much more on their children's education than low-income households." With the lack of total income, low-income families can't afford to spend money on their children's education. Research has shown that over the past few years, families with high income has increased their spending on their children's education. High income families were paying $3,500 per year and now it has increased up to nearly $9,000, which is seven times more than what low income families pay for their kids' education. The increase in money spent on education has caused an increase in college graduation rates for the families with high income. The increase in graduation rates is causing an even bigger gap between high income children and low-income children. Given the significance of a college degree in today's labor market, rising differences in college completion signify rising differences in outcomes in the future. Family income is one of the most important factors in determining the mental ability (intelligence) of their children. With such bad education that urban schools are offering, parents of high income are moving out of these areas to give their children a better opportunity to succeed. As urban school systems worsen, high income families move to rich suburbs because that is where they feel better education is; if they do stay in the city, they put their children to private schools. Low income families do not have a choice but to settle for the bad education because they cannot afford to relocate to rich suburbs. The more money and time parents invest in their child plays a huge role in determining their success in school. Research has shown that higher mobility levels are perceived for locations where there are better schools. ^ Heckman, J.J. and Mosso, S., 2014. The economics of human development and social mobility. Annu. Rev. Econ., 6(1), pp.689-733. ^ Grusky, David B. & Erin Cumberworth (February 2010). "A National Protocol for Measuring Intergenerational Mobility" (PDF). Workshop on Advancing Social Science Theory: The Importance of Common Metrics. Washington, D.C.: National Academy of Science. Retrieved 15 July 2014. ^ Lopreato, Joseph & Hazelrigg, Lawrence E. (December 1970). "Intragenerational versus Intergenerational Mobility in Relation to Sociopolitical Attitudes". Social Forces. 49 (2): 200–210. doi:10.2307/2576520. JSTOR 2576520. ^ Orsetta Causa; Åsa Johansson (July 2009). "Intergenerational Social Mobility Economics Department Working Papers No. 707". Organisation for Economic Co-operation and Development. ^ Grusky, David B & Robert M. Hauser (February 1984). "Comparative Social Mobility Revisited: Models of Convergence and Divergence in 16 Countries". American Sociological Review. 49 (1): 19–38. doi:10.2307/2095555. JSTOR 2095555. ^ Collins, Patricia Hill (1998). "Toward a new vision: race, class and gender as categories of analysis and connection". Social Class and Stratification: Classic Statements and Theoretical Debates. Boston: Rowman & Littlefield. pp. 231–247. ISBN 978-0-8476-8542-4. ^ a b c d Greenstone, M; Looney, A; Patashnik, J; Yu, M (18 November 2016). "Thirteen Economic Facts about Social Mobility and the Role of Education". Brookings Institution. Retrieved 5 April 2017. ^ Lareau, Annette (2011). Unequal Childhoods: Class, Race, and Family Life. University of California Press. ^ a b c Haveman, Robert; Smeeding, Timothy (1 January 2006). "The Role of Higher Education in Social Mobility". The Future of Children. 16 (2): 125–150. doi:10.1353/foc.2006.0015. JSTOR 3844794. ^ Bourdieu, Pierre (1984). Distinction: A Social Critique of the Judgement of Taste. London: Routledge. ISBN 978-0415567886. Retrieved 15 February 2013. ^ a b Lareau, Annette. Unequal Childhoods: Class, Race, and Family Life. University of California Press. ^ Bowen, William; Bok, Derek (20 April 2016). The Shape of the River : Long-Term Consequences of Considering Race in College and University Admissions. Princeton University Press. ISBN 9781400882793. ^ a b c Massey, Douglas; Charles, Camille; Lundy, Garvey; Fischer, Mary (27 June 2011). The Source of the River: The Social Origins of Freshmen at America's Selective Colleges and Universities. Princeton University Press. ISBN 978-1400840762. ^ Becker, Gary (1964). Human Capital: A Theoretical and Empirical Analysis, with Special Reference to Education. New York: Columbia University Press. ^ Causa, Orsetta & Åsa Johansson (2011). "Intergenerational Social Mobility in OECD Countries". Economic Studies. 2010 (1): 1. doi:10.1787/eco_studies-2010-5km33scz5rjj. ^ Miles Corak (8 July 2013). "Income Inequality, Equality of Opportunity, and Intergenerational Mobility" (PDF). Journal of Economic Perspectives. 27 (3): 79–102. doi:10.1257/jep.27.3.79. Forthcoming in the Journal of Economic Perspectives . ^ Wilkinson, Richard & Kate Pickett (2009). The Spirit Level: Why Greater Equality Makes Societies Stronger. Bloomsbury Press. ISBN 978-1608190362. ^ Isaacs, Julia B. (2008). International Comparisons of Economic Mobility (PDF). Brookings Institution. Archived from the original (PDF) on 21 July 2014. ^ a b Corak, Miles (2006). "Do Poor Children Become Poor Adults? Lessons from a Cross Country Comparison of Generational Earnings Mobility" (PDF). In Creedy, John; Kalb, Guyonne (eds.). Dynamics of Inequality and Poverty. Research on Economic Inequality. 13. Emerald. pp. 143–188. ISBN 978-0-76231-350-1. ^ "Financial Security and Mobility - Pew Trusts" (PDF). ^ Blanden, J.; Machin, S.; Goodman, A.; Gregg, P. (2004). "Changes in intergenerational mobility in Britain". In Corak, M. (ed.). Generational Income Mobility in North America and Europe. Cambridge: Cambridge University Press. ISBN 978-0-521-82760-7. ^ Goldthorpe, John; Jackson, M. (2007). "Intergenerational class mobility in contemporary Britain: political concerns and empirical findings". British Journal of Sociology. 58 (4): 525–546. doi:10.1111/j.1468-4446.2007.00165.x. PMID 18076385. ^ Gorard, Stephen (2008). "A reconsideration of rates of 'social mobility' in Britain: or why research impact is not always a good thing". British Journal of Sociology of Education. 29 (3): 317–324. doi:10.1080/01425690801966402. ^ Clark, Tom (10 March 2010). "Is social mobility dead?". The Guardian. London. ^ "Ever higher society, ever harder to ascend". The Economist. 29 December 2004. Retrieved 15 February 2013. ^ Mitnik, Pablo; Cumberworth, Erin; Grusky, David (2016). "Social Mobility in a High Inequality Regime". Annals of the American Academy of Political and Social Science. 66 (1): 140–183. ^ Jäntti, Markus; Bratsberg, Brent; Roed, Knut; Rauum, Oddbjörn; et al. (2006). "American Exceptionalism in a New Light: A Comparison of Intergenerational Earnings Mobility in the Nordic Countries, the United Kingdom and the United States". IZA Discussion Paper No. 1938. Bonn: Institute for the Study of Labor. ^ Isaacs, Julia; Sawhill, Isabel (2008). "Reaching for the Prize: The Limits On Economic Mobility". The Brookings Institution. Retrieved 15 February 2013. ^ Maclean, Mairi; Harvey, Charles; Kling, Gerhard (1 June 2014). "Pathways to Power: Class, Hyper-Agency and the French Corporate Elite". Organization Studies. 35 (6): 825–855. doi:10.1177/0170840613509919. ISSN 0170-8406. ^ Piketty, Thomas (2014). Capital in the 21st century. Belknap Press. ISBN 978-0674430006. ^ Phillip Brown; Diane Reay; Carol Vincent (2013). "Education and social mobility". British Journal of Sociology of Education. 34 (5–6): 637–643. doi:10.1080/01425692.2013.826414. ^ Sullivan, Alice; Parsons, Samantha; Green, Francis; Wiggins, Richard D.; Ploubidis, George (2017). "The path from social origins to top jobs: social reproduction via education". The British Journal of Sociology. 69 (3): 776–798. doi:10.1111/1468-4446.12314. ISSN 1468-4446. PMID 28972272. ^ "DPS Graduation rates are up 6.5 percentage points over last year and 11 percentage points since 2010-11". 6 March 2015. ^ "WESTCHESTER COUNTY GRADUATION RATE DATA 4 YEAR OUTCOME AS OF JUNE". ^ a b c d e f g h i Deary, I. J., Taylor, M. D., Hart, C. L., Wilson, V., Smith, G. D., Blane, D., & Starr, J. M. (2005). Intergenerational social mobility and mid-life status attainment: Influences of childhood intelligence, childhood social factors, and education. Intelligence, 455–472. ^ a b c Deary, I. J., Whiteman, M. C., Starr, J. M., Whalley, L. J., & Fox, H. C. (2004). The Impact of Childhood Intelligence on Later Life: Following Up the Scottish Mental Surveys of 1932 and 1947. Journal of Personality and Social Psychology, 130–147. ^ a b c d e Johnson, W., Brett, C. E., & Deary, I. J. (2010a). The pivotal role of education in the association between ability and social class attainment: A look across three generations. Intelligence, 55-65. ^ a b c Johnson, W., Brett, C. E., & Deary, I. J. (2010b). Intergenerational class mobility in Britain: A comparative look across three generations in the Lothian Birth Cohort 1936. Intelligence, 268–281. ^ Breen, R., & Goldthorpe, J. H. (2001). Class, mobility and merit: The experience of two British birth cohorts. European Sociological Review, 17, 81–101. ^ von Stumm, S., Gale, C. R., Batty, G. D., & Deary, I. J. (2009). Childhood intelligence, locus of control and behaviour disturbance as determinants of intergenerational social mobility: British Cohort Study 1970. Intelligence, 37(4), 329-340. ^ Scottish Council for Research in Education (1933). The intelligence of Scottish children: A national survey of an age-group. London, UK7 University of London Press. ^ General Register Office (1966). Classification of occupations 1966. London, UK7 HMSO. ^ Sorjonen, K., Hemmingsson, T., Lundin, A., & Melin, B. (2011). How social position of origin relates to intelligence and level of education when adjusting for attained social position. Scandinavian Journal of Psychology, 277–281. ^ a b Nettle, D. (2003). Intelligence and class mobility in the British population. British Journal of Psychology, 551–561. ^ Forrest, L. F., Hodgson, S., Parker, L., & Pearce, M. S. (2011). The influence of childhood IQ and education on social mobility in the Newcastle Thousand Families birth cohort. BMC Public Health, 11(1), 895. ^ Young, M., & Gibson, J. (1963). In search of an explanation of social mobility. The British Journal of Statistical Psychology, 27-36. ^ a b c d Cremer, Helmuth; Donder, Philippe De; Pestieau, Pierre (1 August 2010). "Education and social mobility". International Tax and Public Finance. 17 (4): 357–377. CiteSeerX 10.1.1.637.2983. doi:10.1007/s10797-010-9133-0. ISSN 0927-5940. ^ "Social Mobility and Education | The Equality Trust". www.equalitytrust.org.uk. Retrieved 6 April 2017. ^ a b c d "Thirteen Economic Facts about Social Mobility and the Role of Education | Brookings Institution". Brookings. 26 June 2013. Retrieved 6 April 2017. ^ a b Herrnstein, Richard (1994). The Bell Curve: intelligence and Class Structure in American Life. Free Press. ISBN 978-0-02-914673-6. Wikimedia Commons has media related to Social mobility. Nancy Birdsall; Miguel Szekely (July 1999). "Intergenerational Mobility in Latin America: Deeper Markets and Better Schools Make a Difference". Carnegie.